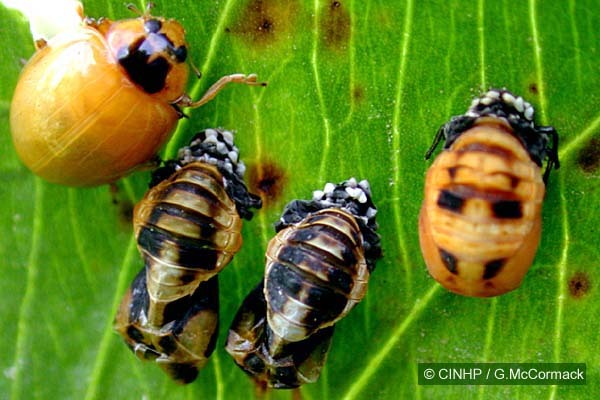 SIGNIFICANCE LIST: Biocontrol - released 19?? 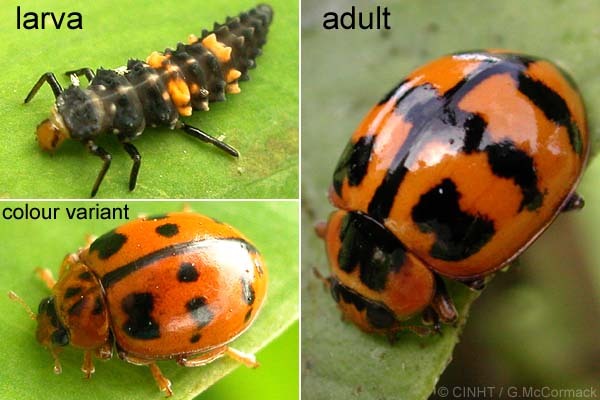 KEY FEATURES: Reddish-yellow ladybird with extensive black markings, to 7mmBL. HEAD reddish-yellow. PRONOTUM reddish-yellow w/wo black quadrate-spot of 4 joined spots. WING-COVER (each) reddish-yellow with 9 black spots fused into 3 bars and an apical spot. Rarotonga: 3 specimens, 1977?9, Krauss, in BPBM unidentified, ID GMcC as Harmonia arcuata 2/2003. Atiu: one specimen, 1976, Krauss, in BPBM unidentified, ID GMcC as Harmonia arcuata 2/2003. Aitutaki: 26 specimens, 1977, Krauss, in BPBM unidentified, ID GMcC as Harmonia arcuata 2/2003. Pukapuka: 2specimens+photo, PK035, 2/2004, on Taro leaves, ID GMcCormack as Harmonia arcuata, reID A.Samuelson as Harmonia octomaculata 5/2004.